US: Seattle gets a raise! End punitive benefit sanctions now! 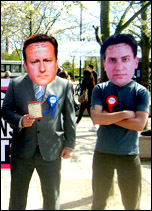 Miliband's 0-hour contracts limit not enough! 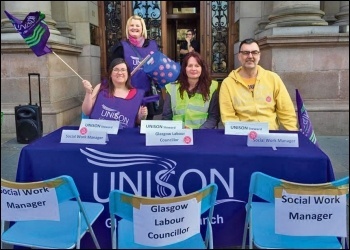 In election hustings Trade Unionist and Socialist Coalition (TUSC) candidates will be asked what their attitude is to immigration. How should Socialist Party members respond? Election hustings: we shall be heard! 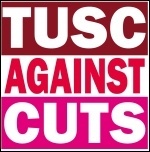 TUSC can beat most of the parties in a fair vote in hustings - if we are given a chance to be heard. The Manchester Evening News's front page read "End cuts and tax the rich"
Easy money: Should Tony Blair's "education, education, education" mantra be replaced by "money, money, money"? They called the leaders' debate last Thursday the meeting of "The Magnificent Seven", but Disney's 'Seven Dwarfs' could have done better - with Dopey surpassing Farage any day! Will SNP deliver on "anti-austerity" promises? TUSC launched its manifesto in Canary Wharf, described by Dave Nellist as "the belly of the beast"
Socialist Party congress, 14-15 February 2015: This document was produced on 5th January 2015 and subsequently some amendments were incorporated during and following the 14th February congress discussion on Britain, writes Socialist Party executive committee, January 2015. All the indicators of homelessness are on the rise. The number of children living in temporary accommodation has risen by nearly 10,000 in the last 12 months. Health service is not safe in Labour or Tory hands: When you go into one of the main blocks at St Bartholomew's hospital in central London, it's almost like going into a posh hotel, writes Alison Hill. Mr Big: A £47 billion takeover bid by oil giant Shell for smaller rival BG Group will net 'Norway's Mr Oil' - Helge Lund - a cool £25 million, for just two months' work! TUSC councillor and Warrington South parliamentary candidate Kevin Bennett has expressed disgust at the Labour Party council voting to "put a time limit on democracy"
I emailed the Diocese of Leicester to ask why TUSC had not been invited to its five-way debate, writes Mike Barker. "This is a rich country, the fifth richest on the planet. It's just that the wealth is in the wrong hands - in the hands of a few millionaires and billionaires. 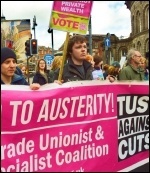 TUSC is the only unashamedly socialist party in these elections." In 2012 Policy Exchange, the Tories favourite think tank, produced a paper - 'Local pay, local growth' - which argued that holding down public sector wages and pensions and bringing them into line with 'equivalent' jobs in the private sector would save £6.3 billion a year. The 100% anti-austerity election broadcast - tonight! Tonight TUSC has its first party election broadcast transmitted across England, Wales and Scotland. "Our hoarding against their hoarding!" Now is a time when fighting back is becoming ever more important. But no mass organisations are willing to play the role of leaders. 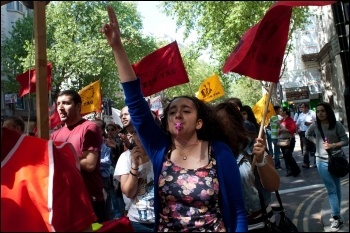 Socialist Students has to step up! The past year has been a bruising one for retail and distribution workers. One supermarket company after another has faced a crisis while high street shop closures have failed to significantly slow, writes Stop the supermarket bosses' attacks on workers. Dallas dreams or fracking nightmare? TUSC's election broadcast - "at last - a left wing alternative"
Housing crisis: We demand rent controls! 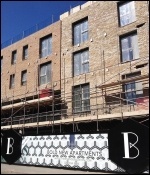 There is a severe crisis in housing. Low pay and sky-high rents mean that private renters spend over half their income paying the rent. In the UK's general election, environment and climate change are issues the establishment parties want to downplay, if not try to forget about entirely, writes Pete Dickenson. 30 years ago: 250,000 school students walked out. This week the housing crisis finally reached Westminster. Are you sickened that in the last year one million people had to rely on food banks? And the rich just get richer! 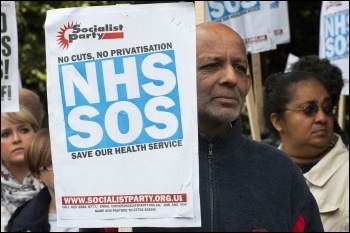 Unite members working for Bromley council have begun a big escalation of the strike campaign launched to defend workers' rights and fight off mass privatisation, writes Socialist Party members in Bromley. 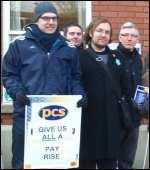 Hundreds of First West Yorkshire bus drivers and engineers were on strike in Bradford on 27-28 April, officially against the transfer of a bus service to the Halifax depot with a loss of eight jobs, writes Iain Dalton. In the Guardian on 22 April, Owen Jones said: "If you want to look in the eyes of those people pummelled by callous Tory policies, vote Labour - and be prepared to fight." 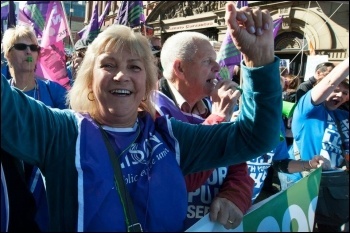 Why the Trade Unionist and Socialist Coalition? It's crunch time. As Britain heads to the polls - and awaits the outcome of subsequent political horse trading - who will fight for the interests of ordinary people?